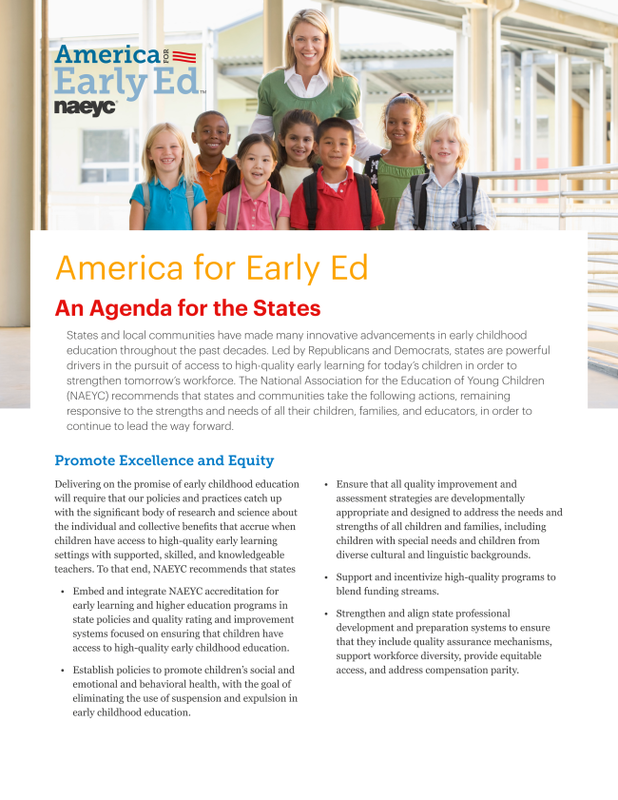 Click here to download the America for Early Ed Policy Agenda [PDF]. Embed and integrate NAEYC accreditation for early learning and higher education programs in state policies and quality rating and improvement systems focused on ensuring that children have access to high-quality early childhood education. Establish policies to promote children’s social and emotional and behavioral health, with the goal of eliminating the use of suspension and expulsion in early childhood education. Ensure that all quality improvement and assessment strategies are developmentally appropriate and designed to address the needs and strengths of all children and families, including children with special needs and children from diverse cultural and linguistic backgrounds. Support and incentivize high-quality programs to blend funding streams. Strengthen and align state professional development and preparation systems to ensure that they include quality assurance mechanisms, support workforce diversity, provide equitable access, and address compensation parity. Regional Advocacy Trainings are being held across Ohio during April and May! Click here to learn more about Regional Advocacy Trainings. The information below is provided by Groundwork Ohio. Increasing rates for quality-rated providers to align with the federal guidance that recommends publicly funded child care providers be reimbursed at or above the 75th percentile of the most recent market rate to provide sufficient access for publicly funded children to quality care. Expanding the eligibility criteria from 130% of the Federal Poverty Level (FPL) to 150% FPL to serve more at-risk children in a quality rated program that positions them for success early and drives outcomes throughout the lifespan. Increasing investments to support the early childhood education workforce in order to recruit and retain qualified professionals. Targeting quality center-based and home-based early childhood programs to open locations in areas of the state identified as “quality deserts” with little to no access for children to receive quality programming. Learn more about the Equitable Access Coalition. NAEYC's public policy goal is a well-financed, high-quality system of early childhood education for all children from birth to age eight. Join NAEYC's Children's Champions E-Mail List to receive regular updates and action alerts on federal and state early childhood policy issues. 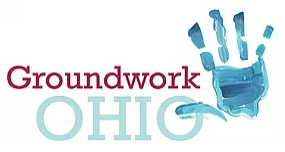 Groundwork Ohio is a nonprofit, nonpartisan advocacy organization that advances quality early learning and development as the most transformative strategy to improve school outcomes, increase the life-long success of Ohio’s children, and lay a strong foundation for economic prosperity in our state. 4C for Children educates and support the adults—parents, child care providers, preschool teachers, early learning program administrators—who care for young children and prepare them for success in school and life. We also advocate for public support for quality early education and care for all children. Action for Children is the local child care resource and referral agency for Central Ohio; serving Columbus and Franklin County, as well as Delaware, Fairfield, Licking, Madison, Pickaway, and Union Counties. Their mission is to transform the lives of children by supporting, empowering, and advocating for the adults who make the biggest impact on children’s lives—their parents, caregivers and teachers.